In the current time’s the Internet, social media, and mobility have changed the marketplace dynamics; customers are hyper aware and completely informed of all the choices flooding the global market. To capture new customers and keep existing clients, Companies are increasingly turning towards creating brand differentiation through customer engagement rather than concentrating solely on product and price. To provide truly comprehensive and exceptional customer experience, organizations are putting in more money and effort into their Customer Care Centers (often the first and only point of contact for most customer interactions) and are increasingly turning towards technology as an aid to streamline operations and increase productivity. While technology has always been a part of the Contact Center landscape, the advent of cloud platforms has now made cloud benefits such as agility, scalability and cost reduction available to Contact Centers as well. Contact Center as a Service (CCaaS), a flexible pay-per-use model allows businesses to purchase and integrate the best and the latest Contact Center technology with their existing or new Contact Centers to provide world class customer engagement. Delivered via the cloud, CCaaS offers a complete solution that includes services such as automatic call distribution, dialer, logger, multimedia or omni-channel capability, all of which can be ramped up or down on demand. Sify has a rare combination of being a Service Provider for Connectivity Solutions, Collaboration applications, and Contact Center applications. This enables us to provide tailor-made solutions to customers. We have partnered with Enghouse, one of the leading technology vendors of Contact Center platform for the Service Provider industry. 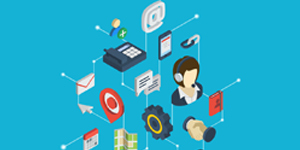 Sify provides all Contact Center applications under one umbrella. We have highly experienced installation and support team available round the clock. We ensure pan India and global reach. Our extensive expertise has allowed us to craft a service offering, which is highly flexible, scalable and future-proof. Sify’s CCaaS provides all Contact Center applications under one umbrella – from branch connectivity and video conferencing to 100 % reliable voice calls. Delivered via the cloud, Sify’s CCaaS is a multi-channel platform, which can easily meet the most exacting contact center requirements. Click here to access the benefits of our cloud enabled CCaaS offerings.